The gentleness of a Father, meek Lamb. And not your love that is infinite. I hope in your love to save me. The competence of Gregório de Matos (1636-1696) made him earn the title of one of the greatest poets of the Baroque, in Brazil and in Portugal. His critical spirit gave him the nickname Hellmouth, for often satirizing politicians, merchants and clergy. He wrote lyrical and satirical poems, but his religious poetry brought up his concerns, mirroring the very human afflictions of the seventeenth century, divided between religious heritage Middle Ages 1 and theocentrism; as opposed to anthropocentric and humanist legacy of the Renaissance and the Counter-Reformation Movement 2, 3, of the 16th century. The religious poetry of Gregório is a reflection of human thought, of the Baroque. In the form of lamentation; it expresses the opposition between reason and faith; it externalizes the consciousness of sin, and of regret; it is a request for forgiveness; it shows the desire for spiritual purification. Fig. 1 – St. Peter's Square, Vatican, projected by Bernini, 1656-1667. Photo of FedeCandoniPhoto. Opposed to the trend, conservative critics, later designated the name to conceptualize the Baroque style, as absurd or grotesque. For them, the Greek and Roman models should never be abandoned and "despising the rules of the Ancient Architecture looked, to these critics, a deplorable lack of taste" (GOMBRICH, 1988, p.302). Contradicting such thoughts, Baroque outcroped, certifying the competence of artists who loaded their Works with emotion. The first manifestations of the Baroque occurred in the Plastic Arts and originated in Italy, spreading later, to other countries in Europe and in America, including Brazil. Attracted by the work in the construction of churches and palaces, many artisans, painters and sculptors went to Rome, which at the time, was a major center of innovation. The predominance of emotion over reason was one registered mark of the Baroque, opposed, the balance of the Renaissance austerity. This duality was evident, in the contrast between light and dark, in Painting. The Mannerist Art, that had left the legacy of dynamism and movement, joined the exaggerated drama, the use of strong colors, and mythological and religious subjects, with a tendency for decorative. Fig. 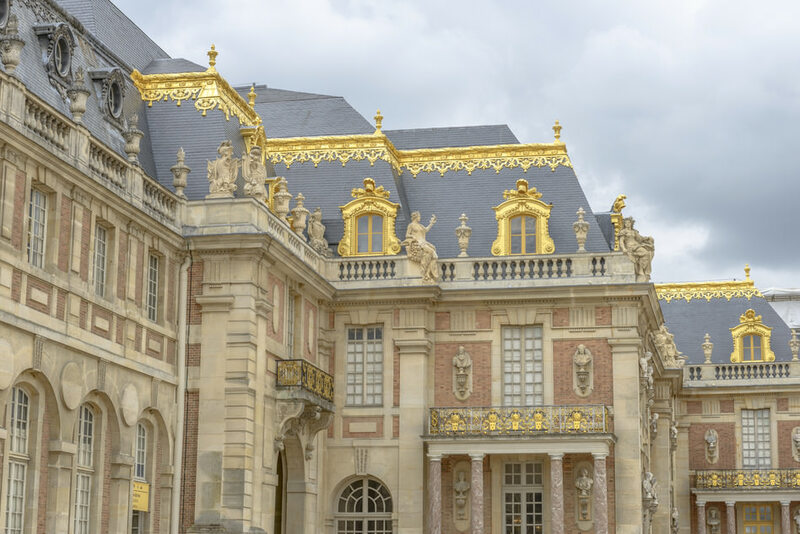 2 – Palace of Versailles, France. Photo of bargotiphotography. The opulence and excess of the style can be explained through the historical situation. Religious Reforms made emerge the new churches, such as the Anglican, the Calvinist and the Lutheran. The power of the Catholic Church was objected, then the Church reacted with the Counter-Reformation, opposing the Protestantism; leading to the creation of the Society of Jesus; and bringing back the Inquisition. The Art entered in this framework, as a way of promoting the image of the Church, which lost its force, in Europe. The intention of impressing and spreading the Christian doctrine became clear in the majesty of the churches. Among the names of the period, are the Italian painter, sculptor and architect Gianlorenzo Bernini (1598-1680); and the set designer, painter, theorist, teacher, decorator and architect Andrea Pozzo (1642-1709), who also served as a lay brother, in the Society of Jesus. One of the most representative Works of the Baroque Architecture and Urbanism, was projected by Bernini. 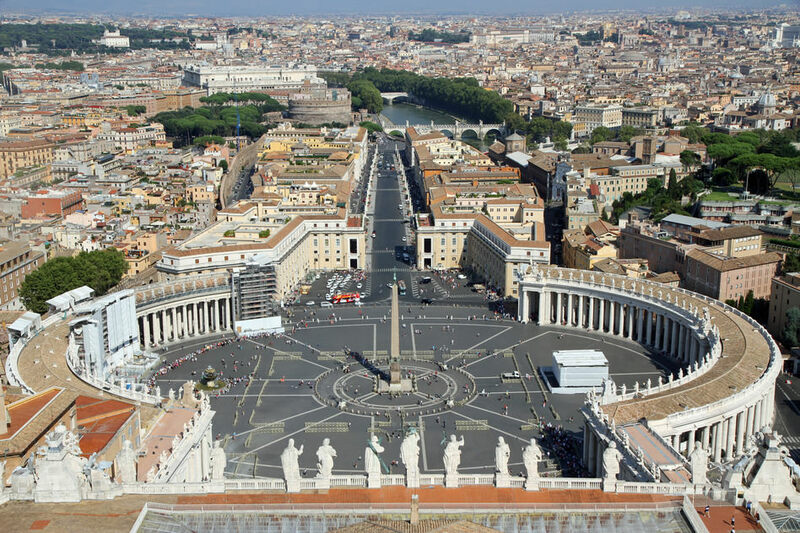 He was a fervent Catholic, who designed the St. Peter's Square (Fig. 1), in Vatican. The harmonious architectural set features a colonnade, or row of symmetrically arranged columns, circular in shape, composed of 284 columns, with 17 meters wide, by 23 meters of height. Over them, are 162 sculptures of 2,7 meters of height. These columns bind to the facade of the church, in a straight line. The center of the square also features an obelisk of 40 meters, from the Ancient Egypt, from the first century, brought to Rome, by Emperor Caligula. Besides the square, which is the gateway to the state of the Vatican, Bernini left several sculptures that can still be seen, in Vatican and in Rome. Fig. 3 – Palace of Versailles, France, The Royal Orangery. Photo of ivantagan. If, on the one hand, the far-fetched style reveals a greater purpose for the Church, which was the affirmation of faith; on the other hand, to the rulers, the Baroque came as a way of demonstrating power and wealth ostentation. The palaces, opposed, to the Renaissance rationality, and left the marks of magnificence and splendor on the meticulous decoration. Built in the 17th century and representing the economic power of royalty, during the Absolutism, the Palace of Versailles (Fig. 2), in the suburbs of France, is one of the largest in the world. It was transformed into a museum in 1837 and declared a World Heritage by Unesco, the luxurious building houses numerous art works and a fancy decoration, inside, with gold details on the walls and on the ceiling. Among the architects who designed its long construction, are the French Louis Le Vau and Jules Hardouin-Mansant. Its gardens (Fig. 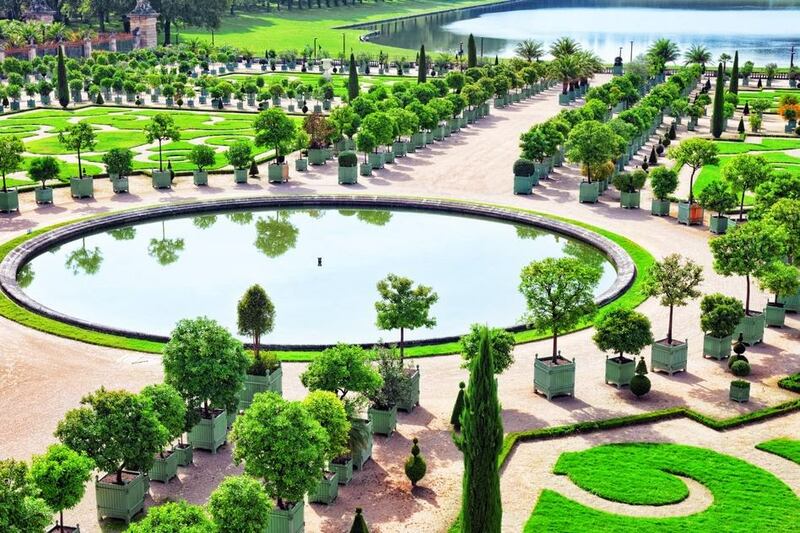 3), the largest ever created, are true Works of art, with canals, ponds, fountains, sculptures and woods. Its imposing landscape design, reached the ultimate goal of construction, to impress visitors. Fig. 4 – Sant’Ignazzio Church, Andrea Pozzo, 1691-1694. Photo of wastesoul. If the soul is not small. You have to go beyond pain. Opposed to the Renaissance, the Baroque artist sought to move the viewer, through the drama and excitement of feeling, intensely, these traces were evident in the sculpture of the period. The images, occasionally are grouped, to form beautiful and dramatic scenes, with people interacting, moving and writhing exaggerated. Fig. 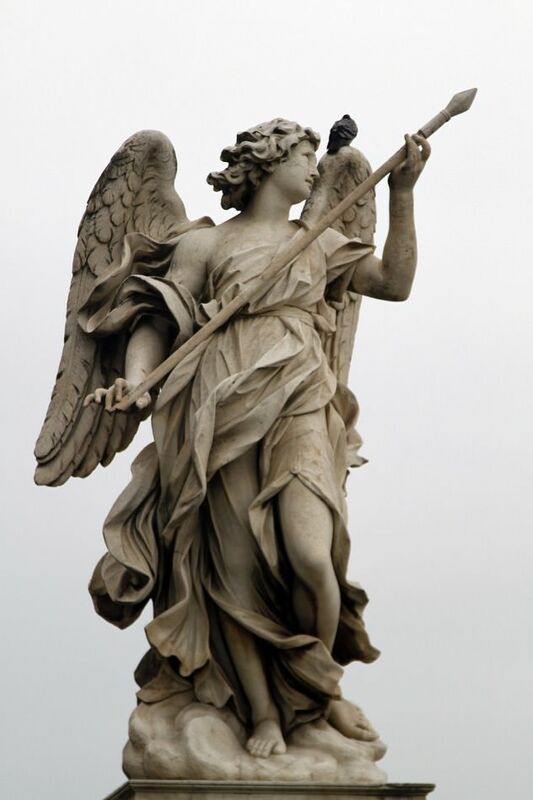 5 – Angel on a bridge near the Castle Sant’Angelo, Bernini, Rome, 1669. 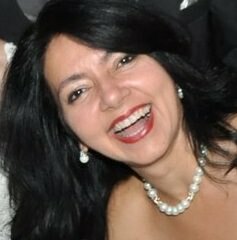 Photo of membio. The curved lines of the bodies, sometimes, are covered by clothing, they have movement in their drapes and fabrics, as under the effect of the wind. In the work of Bernini (Fig. 5), it is possible that the look is lost, for its abundance of details of the angel, in the face, in the hands, in the feet and in the clothing. The hair and clothes of the angel move with the breeze, revealing body parts. A faint outline of the legs suggests that he is up to walk. Attentive to the object in his hands, he seems to smile. In continuous sorrows the joy does. If the sun sets, why does it rise? If the light is beautiful, why doesn’t it last? How does beauty so is transformed? How can on the taste of the quill, one rely? Fig. 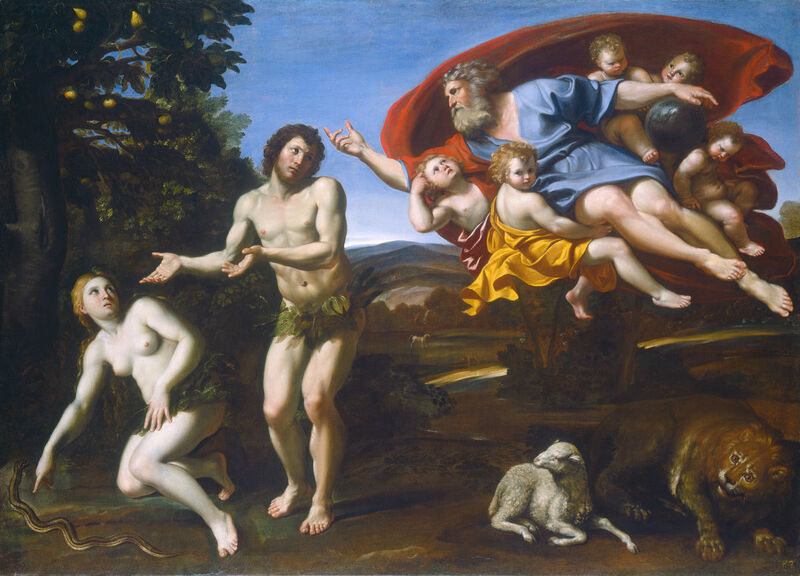 6 – The Rebuke of Adam and Eve, 1626, Oil on canvas, Domenichino, National Gallery of Art, Washington, Patrons’ Permanent Fund. Distant of the Mannerism grace, the Baroque Painting emerged its first signs in Rome, with Caravaggio (1571-1610) and Annibale Carracci (1560-1609). The style was then followed by other painters, such as Domenichino (1581-1641), Guido Reni (1575-1642), Pietro da Cortona (1596-1669), Luca Giordano (1634-1705) and ended up moving to other Italian cities and towns and to other countries. It is also worth mentioning that Bernini himself, was a sculptor, an architect, and a painter, as a hobby. Yet emerged in the Baroque, the talent of Artemisia Gentileschi (1593-1654), one of the first women renowned as an artist. Her independent style consisted of often shadowy paintings, serious and religious themes, far from, the women's traditional paintings. The emphasis on emotions, the sharp and theatrical movement created a new realism in painting, departed from the mannerist grace. Were portrayed, the Mythology, the customs and the religion of the time. Biblical themes appeared as an instrument of the Church, for spreading the Christian faith, demonstrating the greatness of God. In the scenes of Caravaggio, there is a sharp contrast between light and dark; and worldly figures, acquire sorrow aspect. In Caracci’s paintings, on the other hand, the hero is idealized; he is in a more balanced and illuminated scene. Fig. 7 – Joseph and Potiphar’s wife, 1649, Oil on canvas, Guercino, National Gallery of Art, Washington, Patrons’ Permanent Fund. Known as Domenichino, because of his short stature, Domenico Zampieri was painter, a sculptor and a musician. As an apprentice of Annibale Carracci, he acquired his classicist style. He excelled in painting religious subjects and showed great skill with figures and landscapes. The contrast between light and dark and lush colorful, are some of his marks, present in his "Adam and Eve" Work (Fig. 6). In the narrative, God is punishing Adam, pointing to Eve, blaming her for falling into sin. Eve, on the other hand, blames the serpent. The figure of God with angels is inspired in the image Creation of Adam, by Michelangelo, in the Sistine Chapel ceiling. In the painting, there are free animals around and the Tree of Knowledge, represented by a fig tree, according to the Italian tradition. Domenichino's works were admired by French academic artists and his narrative style came to influence Nicolas Poussin, of the Neoclassical. The Art of Caravaggio also influenced the Flemish painters. From the Flanders and Spain, it is worth mentioning names such as Antoon Van Dyck (1599-1641) and Jacob Jordaens (1593-1678) who, early in their careers, worked for Peter Paul Rubens (1577-1640). In the Netherlands, it is worth mentioning Rembrandt (1606-1669); and Spain, Bartolomé Esteban Perez Murillo (1617-1682), Valdés Leal (1622-1690) and Diego Velázquez (1599-1660). Fig. 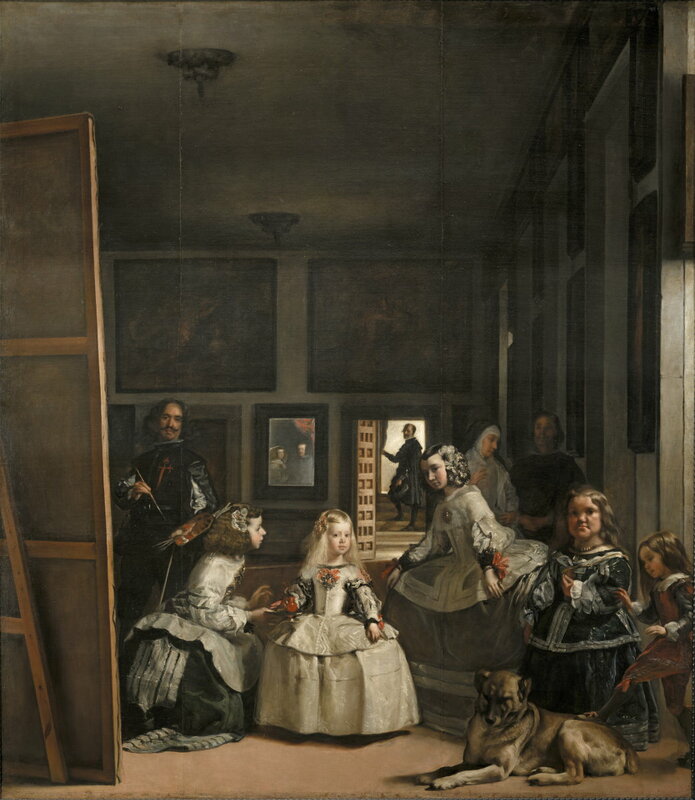 8 – Las Meninas, or The Family of Felipe IV, 1656, Oil on canvas, Diego Velázquez, Museo del Prado, Royal Collection. A simple everyday scene of the royal family, in the Felipe IV Court, was portrayed brilliantly, by Velázquez (Fig. 8). The artist worked with the meta-language, by allowing creative possibilities and various interpretations, possible, of the same image. The atmosphere is decorated with paintings, that are part of the palace collection. The contrast between dark and light allows the understanding different plans of distribution of people and objects, providing a sense of depth. Everyone seems to be looking for a couple, that does not appear in the scene, but their image is reflected in the mirror, at the back of the room. On another plane, more enlightened and beyond, are the King's daughter, with some people and a dog. In the background, next to the open door, there is an employee of the palace, who seems to greet everyone. Velázquez painted himself in the scene, and in his garments, there is a cross of the Order of Santiago, which may have been intentional to detach his profession (VIG, 2010, p.58,59). Due to the light in the room, it looks like there is an open window. The work, is one of the most studied, and received in 1957, a reinterpretation of Picasso, in the mold of Cubism. Fig. 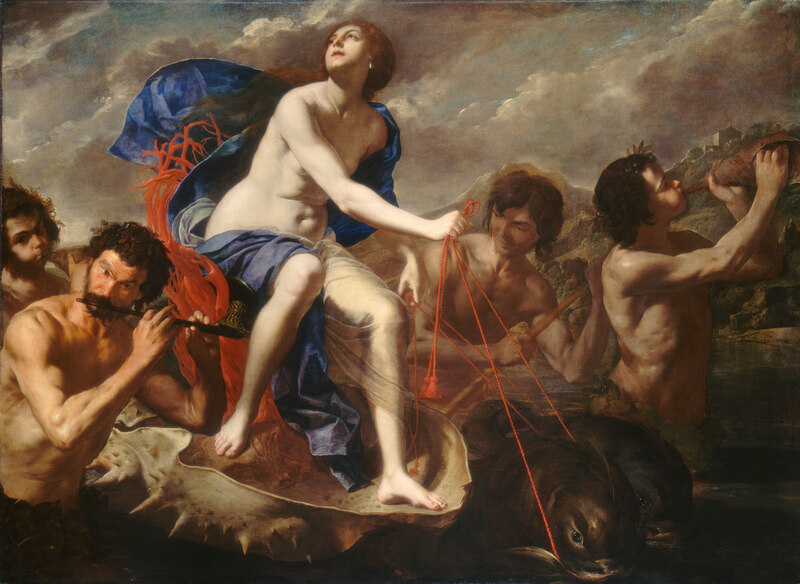 9 – The Triumph of Galatea, 1650, Oil on canvas, Bernardo Cavallino, National Gallery of Art, Washington, Patrons’ Permanent Fund. Perhaps Schiller's words are ideal for a reflection over the Baroque style. The philosopher talks about a deeper sense, in Art. So was the Baroque, in the artist's creative act; by allowing emotions to emerge. It is even so that Art works. The artist operates freely on the material that most delights him; it touches the inside, outcrops itaflore and translates into thought, and history. 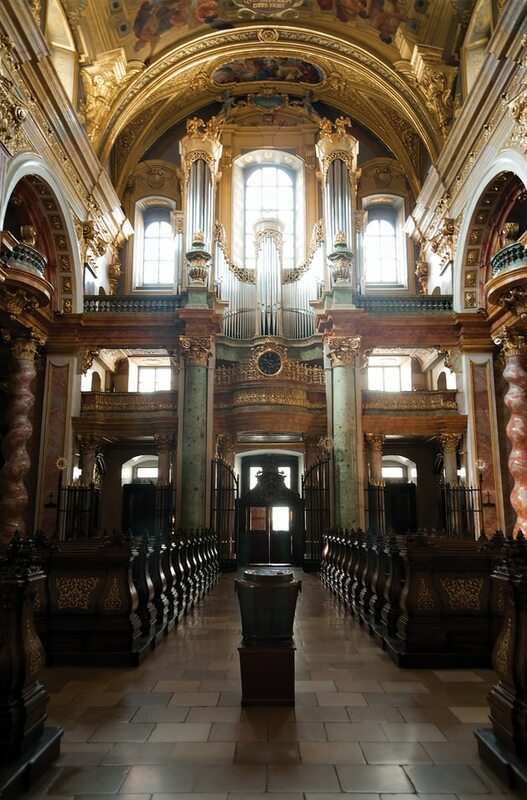 The excesses and emotional states of the Baroque form a seductive set, which calls us to fruition. Understanding this game is going back in time; and allowing emotions to come to light; It is the greatest pleasure, in Art. For years I sought the opportunity of leading the viewer to "walk" inside the frame, of forcing him to merge in the painting, forgetting himself. BASTOS, Alcmeno. Poesia Brasileira e Estilos de Época. Rio de Janeiro: Viveiros de Castro Edtora, 2004. KANDINSKY, Wassily. Olhar sobre o Passado. São Paulo: Ed. martins Fontes, 1991. PESSOA, Fernando. Obra Poética I. Porto Alegre: L& PM Pocket, 2006. Fig. 1 – Saint Peter's square, Vatican, projected by Bernini, 1656-1667. Photo of FedeCandoniPhoto.